Register for a FREE intro session for 2019! For me happiness is being Simply Music Piano Teacher! Simply Music is the largest playing based music education institution in the world. We offer many of their unique and innovative programs. 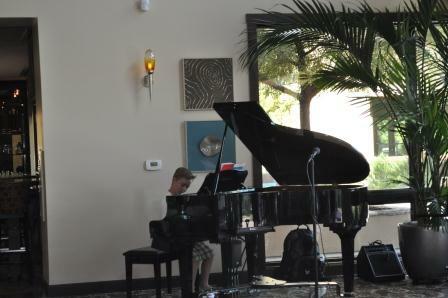 If your child is under 12, plan to attend lessons and learn to play piano along with your child at no additional cost! Click here for information about how to choose an instrument. The Simply Music approach focuses on the fun and sheer pleasure of playing music! From the very beginning, this piano playing based method has you playing a huge variety of music including composing, improvising, arranging, playing accompaniment, classical, blues and jazz, understanding and reading music, all done by Simply Music's unique, "playing based" approach. Everyone is musical, whether we realize it or not our ability to walk and talk demonstrates a profound mastery over complex rhythmical and musical concepts – this is our natural ‘musicality’. We use this natural musicality in conjunction with our revolutionary approach to music education and have students immediately playing great-sounding music with ease at the piano. Who can benefit from learning from the Simply Music Program? This remarkable and fun approach has students of all ages playing great-sounding contemporary, classical, gospel, blues, jazz and accompaniment pieces, immediately, from their very first lessons! Contact me for your Free Introductory Session Today! A World Where Everyone Plays by Bernadette E. Ashby - Finding a way to bring fun and excitement back into learning! Private Lessons Showcase "Sneek a Peek"
There is so much more to Accompaniment I than just accompaniment! If "scale" is the skeleton of music, then chords are the "meat." Chords are where everything begins so a thorough understanding of chords opens the doors to improvisation and composition, enabling students to interpret any piece of music (such as how the treble and bass clef are related and the musical the progression of the piece). Students who learn the chords actually learn what notes belong together (scale). For example, if you learn the I-IV-V of any key, you know what notes belong in that note family. If you play the I chord in the key of D, then the IV and V and name the notes, you now know what notes are played in the key of D Major. Pretty cool--and totally painless. When students object to Accompaniment, I let them know that knowing chords is going to have a huge impact on their ability to play music, understand music, read music, improvise and compose in addition to knowing how to sightread chords and play with others. Without exception, when I explain my position and the benefits, students get on board. I've had some students that don't especially enjoy accompaniment, so this where it is critical to provide a singing voice or even better, an opportunity to play with a band. It is amazing for students and parents alike. Hearing your child play The Beatles or Coldplay, Adele or a favorite praise and worship song with a band, and do it well is very exciting and highly motivational. Every time we do this, I see the light bulbs go on for students. Finally, knowing chords really aids in improvisation... I love having students discover a chord progression and build pieces or improvise on it. It is such a key to successful improvisation and composition.